Slippery is the first impression that comes to mind when you pick up the U Play. The _phone_ is made with the trendy glass sandwich design, where two sheets of thermoformed cover glass are pressed against a metal frame. HTC has done this in a pretty symmetric manner, and the U Play leaves a quality feeling both when you look at the device and when you hold it. 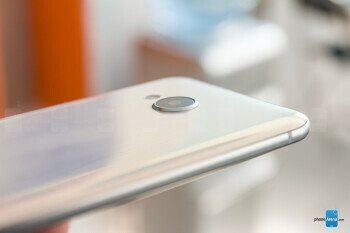 For its size, the handset is light enough. The back has been treated to a fancy paintjob which gives it a hue-shifting reflection. In the case of our white version, that results in a nacre, mother-of-pearl visual effect. 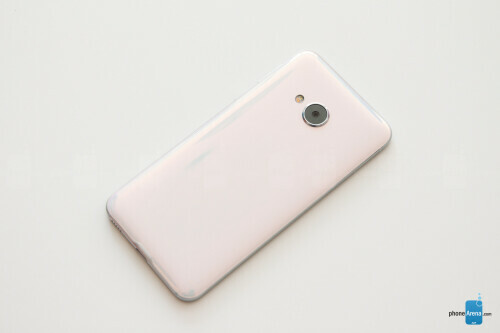 As we mentioned in the beginning, the glassy finish makes the _phone_ a bit slippery to hold, and the tapered sides don't actually facilitate the grip, either. You get used to the exact pressure required to hold onto your precious U Play with time, but this thing would certainly be more manageable with a case on, as it's also a bit wide for its screen size. Speaking of which, screen-to-body ratio of 70% is nothing to write home about these days, and the U Play could have benefited from some slimming of the bezels all around. 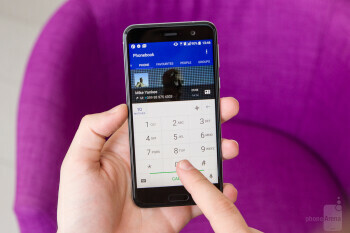 HTC has provided a touch finger scanner/home key combo underneath the display, and two capacitive back and menu keys are flanking it. They all work well, and folks who prefer their fingerprint reader at the front would appreciate the HTC U Play navigation setup. There is a single speaker at the bottom, and two mics for noise cancellation at the upper and lower sides. Thankfully, HTC has gone with a USB-C port for charging or data transfer at the bottom of the U Play. That also serves as audio connection, since there is no standard 3.5mm jack. The metal power key and volume rocker on the right are conveniently sized and placed, easy to find and press without looking, and with good tactile feedback. 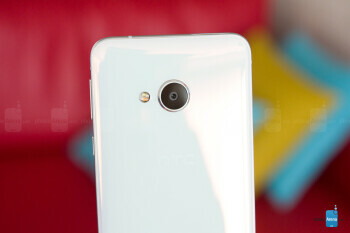 With a 5.2” LCD panel at 1080 x 1920 pixels resolution, HTC leaves little to be desired in the display department. 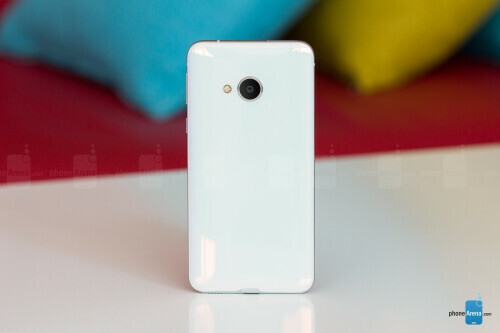 The screen is sufficiently bright, vivid, and with more than enough pixel density for any task you might throw at it. It leans a bit on the cold side, though, and you are getting some oversaturated greens in the process, but it does have a color tone adjustment slider in the settings, if you want to bother. Outdoor visibility is about average, since the brightness is high enough, but reflectivity is a bit too high for enjoying the panel under direct sunlight. Slippery is the first impression that comes to mind when you pick up the U Play. The phone is made with the trendy glass sandwich design, where two sheets of thermoformed cover glass are pressed against a metal frame. HTC has done this in a pretty symmetric manner, and the U Play leaves a quality feeling both when you look at the device and when you hold it. 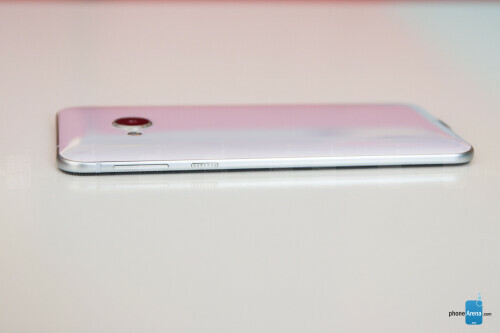 For its size, the handset is light enough. The back has been treated to a fancy paintjob which gives it a hue-shifting reflection. In the case of our white version, that results in a nacre, mother-of-pearl visual effect. As we mentioned in the beginning, the glassy finish makes the phone a bit slippery to hold, and the tapered sides don't actually facilitate the grip, either. You get used to the exact pressure required to hold onto your precious U Play with time, but this thing would certainly be more manageable with a case on, as it's also a bit wide for its screen size. Speaking of which, screen-to-body ratio of 70% is nothing to write home about these days, and the U Play could have benefited from some slimming of the bezels all around. The U Play is managed by HTC's latest Sense interface which is sadly layered on top of Android 6.0 Marshmallow instead of Nougat, though an update should be arriving at a later date. 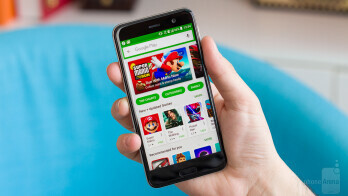 HTC made Sense close to stock Android, relegating most basic tasks to Google's default apps, with only custom theming and some extra features thrown in, so updates should arrive faster and easier. As usual with Sense, the BlinkFeed news and social feeds aggregator makes for a welcome return just to the left of your home screen, but HTC has partnered with News Republic for the novelties feed, and this app is one of the more annoying when it comes to unsolicited “breaking” news notifications that are hard to switch off. HTC's Motion Launch gestures, on the other hand, provide many handy shortcuts to access key functionality while your phone is sleeping. You can double-tap or swipe up the screen to unlock it, for instance, or swipe left to enter BlinkFeed directly. The only thing missing is swiping down on an empty screen area to unfurl the notification shade – such a simple but useful gesture that not many popular brands have implemented yet. 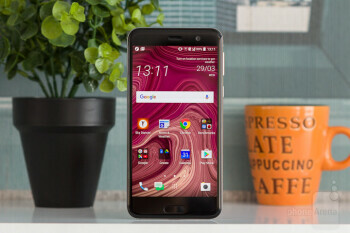 The HTC U Play comes with the company's new Sense Companion, a voice-controlled smart assistant similar to Google's Assistant and Siri. Similar to what most assistants do, the Sense companion will let you interact with your phone with your voice and the assistant will be proactively feeding you with relevant data that might be of interest to you, like weather info, reminding you of upcoming events, and so on. Nothing groundbreaking that you will be using on a daily basis while commuting in a crowded metro car, but HTC says it learns and adapts to your needs in time. 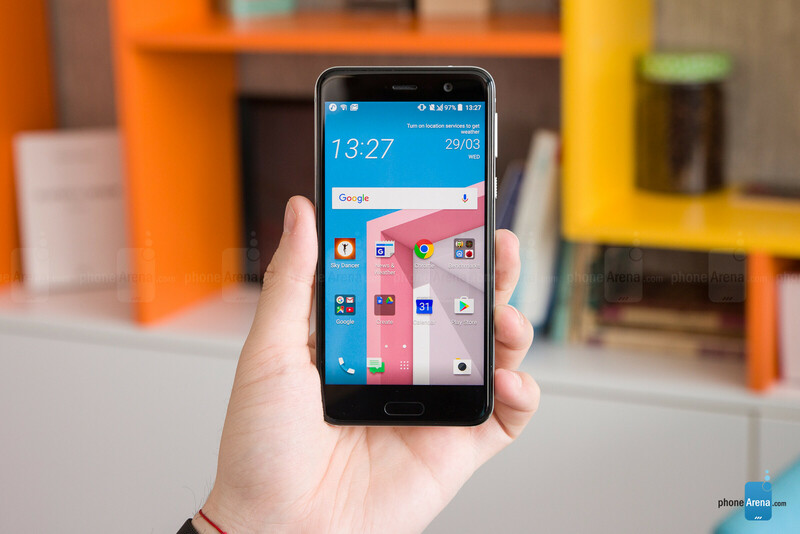 The HTC U Play is powered by a mid-range MediaTek Helio P10 chipset, which is a 64-bit octa-core affair, clocked at 2 GHz. 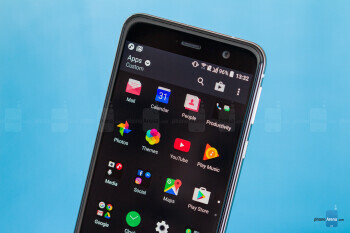 The phone also boasts some 3 gigs of RAM and 32GB of native storage (23GB available), as well as a microSD card expansion slot tucked in the SIM card tray. The interface runs smooth as silk, with no noticeable hiccups to speak of, though HTC doesn't go crazy on complex graphics or transitional animations, either. Some heavy 3D games may encounter hiccups, and we noticed a few unassuming titles that don't show in full bloom on account of the ARM graphics, but for most other purposes this processing power would suffice. Given the MediaTek chipset, don't expect LTE and voice compatibility on all US carriers, save for a few AT&T or T-Mobile bands, as the U Play is meant for international markets. It offers all the usual wireless radios a decent midranger should have, and wired connectivity is done via the USB-C port at the bottom. There is no standard audio jack, though, which might throw some folks off. 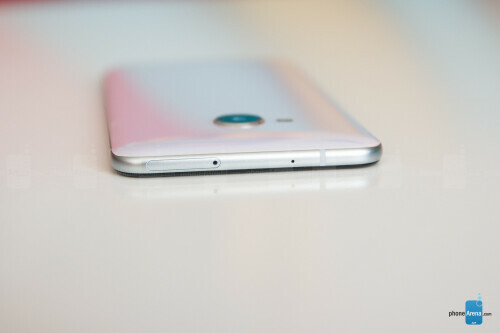 There's an optically-stabilized f/2.0 16MP camera with phase-detection autofocus at the back of the U Play. Although its resolution is larger than the 12MP UltraPixel shooter of the U Ultra, it has smaller 1µm pixels, which tells us that it might have worse low-light performance, in theory at least. The selfie front camera is also a 16MP one that can snap wide panorama selfies of both you and your clique. 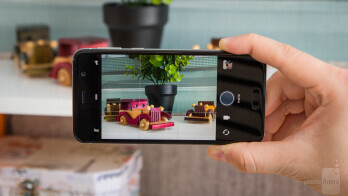 The front cam also has the so-called UltraPixel mode that lowers the resolution, and apparently increases light sensitivity this way up to four times. The camera app interface is greatly simplified, with the most used modes and filters present with big fat buttons, and only a handful of settings hidden a menu deep. It does have a Pro regime, though, where you get a full suite of manual controls, including preset shutter speeds. The HTC Zoe photo diary is another option to spice things up, while the phone offers an automatic HDR option that will measure the scene and choose whether to shoot in HDR or not. HDR shots takes a bit longer from shot to finish, though. As for the pictures, they don't have the usual warm, flashy colors some other phone makers go with, and thus look a bit closer to reality. They are not bland by any means, but most folks prefer their reality spiced up with oversaturated hues and higher contrast. The photos are exposed mostly accurately, especially if the HDR mode has been employed during the shot. They are are often quite softish looking, though, in particular if there is less than ideal light amount splashing the scene, like on a cloudy day or indoors, where bright spots usually get overexposed, too. The selfie camera may soak in more light when it is in the UltraPixel mode indeed, but that usually results in overexposure in daylight, so we'd stick with the 16 MP resolution which returns decent selfies. The U Play maxes out at 1080p video with 30fps, and is optically stabilized, so your hand shake gets compensated for well. 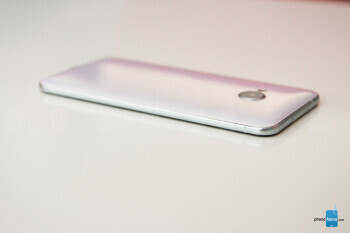 The videos come out with enough detail, credible colors, and no artifacts, save for some rolling shutter. Exposure adjustments are rapid while panning around, and continuous autofocus works sufficiently quickly when moving between near and far objects. On the audio front, HTC has had the courage to get rid of the 3.5mm headphone jack. The onboard USB Type-C port is to be used for audio playback, and, thankfully, the device comes with a rebranded version of the HTC USonic adaptive in-ear headphones that came along the HTC Bolt and 10 Evo a couple of months or so ago. These adapt to your ears and aim to provide a better audio-listening experience for each individual user. This would only work via the USB-C connector, though, and those adjustments aren't valid for your Bluetooth headset, for instance, or third-party sets. The sole loudspeaker at the bottom of the U Play is surprisingly strong, and with fairly clean and full sound for a phone speaker. The earpiece is powerful enough, but the voices sound a bit muffled and hollow in it, plus they get distorted towards the high end of the volume scale. The two noise-canceling mics, however, did a good job relaying our voice loud and clear to the other end, with discernible timbre. 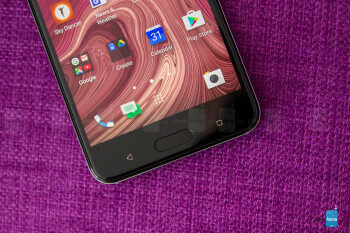 HTC makes do with a 2500 mAh battery pack for the U Play, so it's not surprising that it gives official talk time of just 15 hours or so on a charge. We ran the U Play through our grueling battery benchmark, and the phone lasted 8 hours and 56 minutes. That's far from the 11 hours that the Galaxy A5 (2017) got, but still a very good result from this battery capacity. Standby drain is also managed well, so the phone may last you more than a day with typical use. If you put the 28nm chipset under strain, like during gaming or benchmarks, though, the battery gets eaten quicker than usual. Thankfully, there is also fast charging that would juice up your phone in a quick manner if you run out of juice. 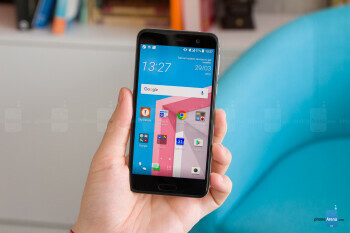 The HTC U Play offers a very pleasant design to look and hold, a simple but functional interface, and decent picture and video capture abilities. It has a steep hill to climb against its direct competitors like the Galaxy A5 (2017), Moto G5 Plus, or the honor 8, though. These have 5.2” 1080p displays like the U Play, and offer cameras of comparable quality, but last longer on a charge and cost less, while the A5 is even waterproof. For the quite respectable $450-$500 price that HTC is charging for the U Play, you can even get a Galaxy S7 now, too, which will offer higher-end features and better camera. Still, the U Play ticks all the boxes in its segment, save for a few camera mishaps, so if you are pleased with its premium design, and don't mind paying a bit extra, it's a nice choice in the midrange category.